Goal / Mission of the Album: Through his music, to give encouragment to listeners in their daily struggles to follow the Lord. Encourage listeners to evaluate themselves, confess their blunders, and to turn to God with their weaknesses, asking for guidance and support. Encourage listeners to seek a relationship with Him, becoming active servants of the Lord through His power. "I believe that there is hope in life, hope that can only be found through relationship with God." Want to be pumped up and encouraged with a bright, insightful contemporary Christian acoustic collection of songs that musically entertains and encourages growth in faith and dependence on the Lord, for strength to endure struggles? 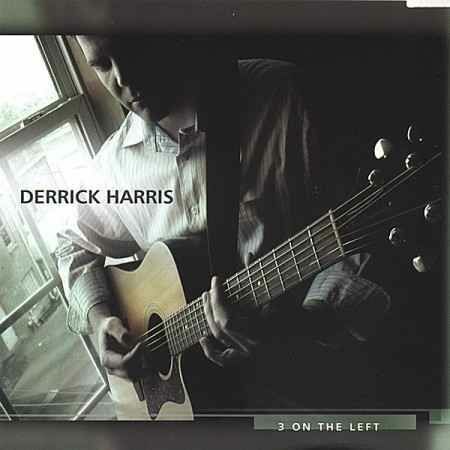 Derrick Harris' ON THE LEFT CD is the album that deserves a spot in your acoustic Christian music collection! This reviewer had the pleasure to listen and examine this musical effort for our readers! Derrick Harris and friends have come together to offer an inspiring collection of well-done, never boring, personable acoustic ballads, that feature favorite qualities of this reviewer: Expressive, poignant, well-performed vocals from the heart, presenting meaty lyrical messages that make the listener think and reevaluate, and a creative variety of well composed and well-performed acoustic compositions, all with a fervent spirit and energy, that flows throughout the album no matter the format of the song. Whether it is a statement anthem of faith and hope (I WILL BE THERE FOR YOU * ONLY FOOLS WILL SURVIVE * I WILL GET BY), an expression of frustration/discouragement and petition (RAIN IS FALLING ON MY BACK * SET ME FREE AGAIN *SEND ME ON MY WAY),or a song of confession/appeal for help (PIGEON SONG *SUNDAY * ON THE LEFT), the music is vibrant, energetic with a fiery spirit that is sure to uplift the discouragement of life, as it points to the hope we have in Jesus Christ. The high production values are the result of the talent brought to this project,ON THE LEFT.. Grammy winner Rob Burrell was in charge of engineering, mixing, and producing this album. Another factor that contributed to the excellence of the sound and energy was the fact that Derrick brought his band of musicians into the studio to record live, rather than record by doing sound tracks, which are mixed together. Whether the listener hears simply a voice with one guitar accompaniment or an ensemble of instruments, ON THE LEFT cd has it all, a shining example of a collection of songs in this genre, which also speak volumes of the high production values. I can describe the compositions as a creative package of acoustic sound, offering a variety of personal ballads, inspired from Derrick's life experience & struggles, and his own relationship with the Lord. All selections are composed around the all important dynamic levels, given interesting rhythms and memorable melodies, from simple to subtle to complex, all reflecting the spirit of melody-carrying vocal performances. As a songwriter and composer, Derrick uses his considerable skills, creating through the guitar / guitar ensemble some most enjoyable, interesting accompaniments. He can compose in either major or minor keys, uses key modulations and interesting musical interludes to spice up compositions, and composes to fit the softness or growing volume needed to fit the songs' dynamic nature. In acoustic music, solo guitars or guitars in groups are typically used to maintain rhythm of the song ,or melody support, or for interlude work. Derrick uses the guitar in all three areas, combining rhythm, melody support, and little interludes in intros, etc., as well, creating compositions that hold the interest of the listener, as well as contribute so much to the overall melody, spirit, energy and mood aura of each song found on this inspiring album. The listener appreciate why Derrick Harris was named Birmingham Al's Best Acoustic artist in by the Birmingham Weekly Music Magazine. The talented, professional ensemble group of instrumental voices are precise, rhythms are impeccable, musically well-mixed, and cook along with spirit, providing the right energy, drive and dynamic level, as well as well-done melody support. The percussion and drumcontributions are at just the right level of volume and intensity, for each song on this CD;From offering just subtle support for the guitar-driven rhythm, to more larger than life, for rock-based compositions, careful though to not dominate, but well blended. Derrick Harris is a gifted musician indeed! Not only can Derrick offer his own unique efforts at songwriting, and really can play and compose for guitar, but he can also sing, knowing full well how to use his natural talents and his strong abilities in vocal performance, matching the energy, spirit of the musical accompaniment, in a style of earnest fervor that captivates the listener. All the songs are very personal, being sung in first person, coming from the heart of a gifted performer, dedicated to a closer walk with Christ. His strong voice has no trouble carrying the melody, propelled with stellar breath control, and ability to reach hard intervals easily. His musical instincts and ability to sing from his spiritual place enables him to express the intended lyrical message with feeling and heart-felt intensity, using dynamics as a powerful tool; making it all so relevant to the listener's struggles with the Christian walk and personal relationship with the Lord. Such a well-done presentation can be "meat" for self-examination and encourage confession, reconciliation and dependence on the Lord. Derrick shares in his bio, ""My music reflects what is going on in my life. My lyrics are honest and from my heart. I believe that there is hope in life, hope that can only be found through relationship with God." The lyrical messages, that range from straightforward, to more complex, inspiring the thinking and pondering process. The message of each song is usually spelled out in the chorus and Bridge sections in a glorious way.DerrickHarris's ability to creatively and poetically express his spiritual insights, result in meaningful lyrical messages, that are brought roaringly to life by his poignant vocal presentations to truly delight and inspire the faith of acoustic-loving enthusiasts, and the contemporary music audience as well!! There are so many elements found in these songs that make this album, ON THE LEFT, a big "MUST GET" for your contemporary acoustic Christian music collection! Vocals and message, spirit and energy, inspiring melodies and accompaniment, terrific musicianship all the way around and stellar production values!